After an anomalous 2011/12 season that saw the majority of clashes between the top sides produce goalfests, this season has continued last year’s reversion to caution, with this installment of the United/Arsenal rivalry providing us with the latest confirmation of this trend. Arsenal set up in the usual 4-2-3-1 shape. Tomas Rosicky, a player that Wenger often calls on for the “big games”, was back in the side, after being surprisingly omitted against Liverpool. Oxlade-Chamberlain dropped out. Kieran Gibbs made his return at left back in place of Nacho Monreal. United were in the same configuration as the home side. Juan Mata started on the left for the first time in a United jersey. Valencia took his right wing slot, with Young relegated to the bench. Tom Cleverley returned to the side in midfield, in place of Darren Fletcher. Both sides could, and should, have opened their accounts early on. In the second minute, Van Persie shot straight at Szczesny after robbing Mikel Arteta just outside the box. Two minutes later, Giroud evaded Nemanja Vidic from a corner, but could only direct his header wide. Both chances were clear-cut. Both foreshadowed the kind of game that both strikers would endure. Giroud hit the target with 0 of his 5 efforts over the course of the game, and somehow failed to connect with a perfect late Sagna cross . Van Persie would go on to spurn two more excellent opportunities. It was obvious from early on that neither side had any intention of pressing the opposition high up the pitch. Arsenal were slightly more ambitious than their visitors, but it was clear that they were fearful of a repeat of last weekend’s pummeling on the break at Anfield, a pummeling that was eerily reminiscent of many they had received from Ferguson’s United side in the recent past. This is a different United side however. The only similarity to Ferguson’s side tonight was the way in which they frustrated Arsenal with a low block, electing to keep it tight and press only in the final third. In this regard both Tom Cleverley and Michael Carrick were excellent. Cleverley made 3 tackles and 4 interceptions and Carrick made 2 tackles and 5 interceptions. 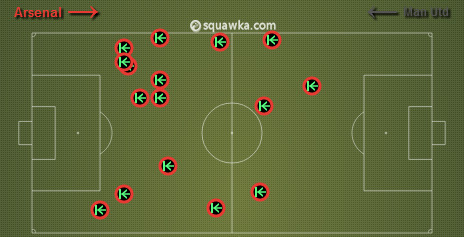 Arsenal only made one successful pass into the penalty area in the first half (Cazorla’s pass that led to Gibbs’ shot in the 35th minute), and would only make two further successful passing ingresses into the 18-yard box in the second period (one of which was the one-two between Ozil and Cazorla that led to De Gea’s stunning low save from the latter). Considering that Arsenal were essentially fielding 5 passers who like to come into the centre in their midfield, this was an impressive feat from the United men. Where this United side differ however is on the break. They were equally impotent from an attacking perspective. The only pass into the area that led to a chance was Mata’s through ball after 18 minutes, which Van Persie somehow contrived to turn into an attack on the innocent corner flag. Their ability to counter attack was almost non-existent, with their only successful venture in this regard coming late on when Carrick robbed Wilshere, passed to Rooney, whose lofted cross found Van Persie in the six-yard box. Szczesny produced a wonderful reflex save to deny his headed effort. A lot of credit must go to Arteta in this regard. He received a lot of flak from Arsenal fans after the hammering at the hands of Liverpool, and somewhat unfairly so. In this system, he plays beside a box-to-box midfielder in Ramsey/Wilshere who generally tends to make an abnormal number of runs forward. He is often stranded in front of his defence. Notwithstanding his early error tonight, he was fantastic, making 5 successful tackles and the same number of interceptions. When you add in how absolutely appalling Wilshere was (dispossessed twice and lost the ball through a poor touch a whopping 6 times), you have to acknowledge how vital his performance was. As disjointed as United were on the break, it was very often this man that stymied them. 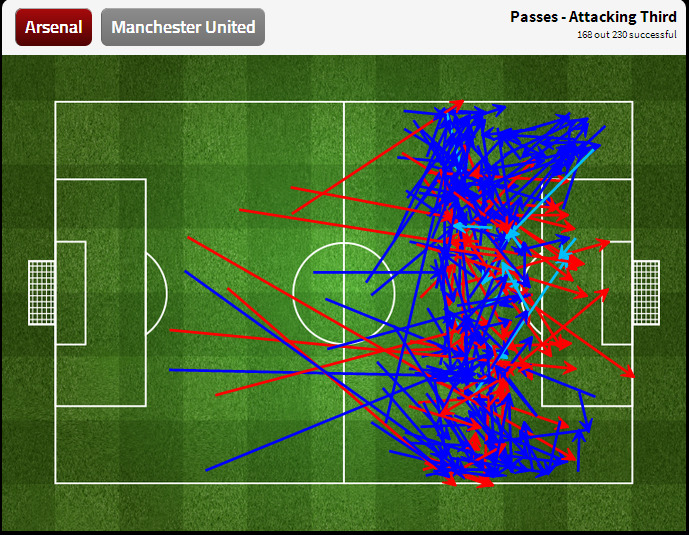 Once again, United were incredibly predictable in their attacking play. 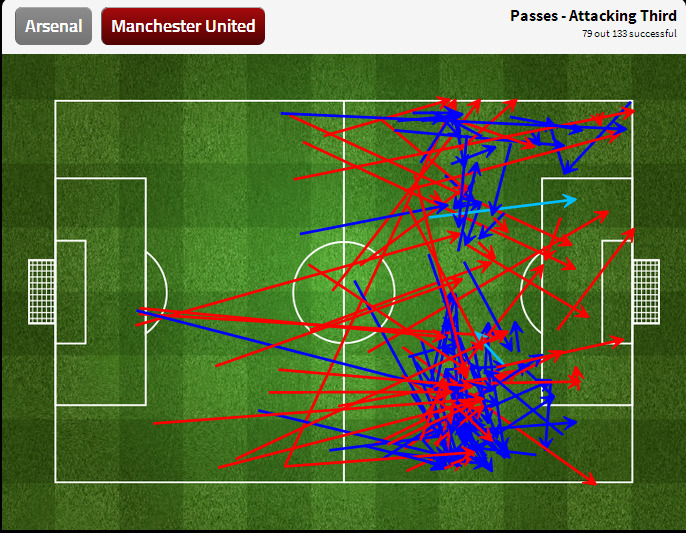 There weren’t 81 crosses this time, but as is now the norm, absolutely everything went down the right hand side. Only 19% of the attacking play went through the middle of the pitch. United are 20th out of 20 in the league this season by this metric. No other team attempts to unlock teams through the centre less regularly than Manchester United. Arsenal’s play, on the other hand, was far more balanced as you can see below. Both managers showed at least a smidgen of ambition on 75 minutes, removing a passer and introducing a more direct player. Wenger swapped Oxlade-Chamberlain for Rosicky and Moyes brought on Januzaj in place of the disappointing Mata. The game opened up a bit from this point (relative to the stasis that preceded it). We had Sagna’s cross that Giroud should have converted. Giroud here, got ahead of Vidic, and not for the first time in the game. Vidic made 4 fouls, more than anyone else in the game, and could have been punished with a penalty for the push on Giroud in the second half. Although he made a large number of headed clearances over the course of the game, the praise for him from some quarters in the aftermath was baffling. Marvel at the way Wilshere breezed past him in the third minute in the box, only for Smalling to produce the saving tackle on the cover. A shadow of the player he once was. This was a fair result in that neither manager showed much ambition beyond it. Both sides sat off, producing little space in behind, little penalty area action and a lot of benign possession in key areas. Both strikers failed in their jobs tonight, spurning two good chances apiece. Both goalkeepers, on the other hand, shone with important saves to preserve parity. Szczesny was particularly impressive, showing that he has developed his sweeping skills significantly, an area of his game that was previously suspect. To summarise – a bit of a non-event really. Leave your thoughts below.